Reigning ONE Middleweight and Light Heavyweight World Champion “The Burmese Python” Aung La N Sang, 33, was not the only local hero who emerged victorious at “ONE: Spirit of a Warrior” at the Thuwunna Indoor Stadium in Yangon, Myanmar on June 29, 2018. His fellow Burmese mixed martial artist Mite Yine, 25, was also one of the 10 winners of the evening. A former two-time Gold Belt Champion, Mite made his professional MMA debut and ONE Championship debut at “ONE: Spirit of a Warrior.” He competed against his fellow former lethwei stars Saw Darwait, 28, in the flyweight division, which is currently dominated by reigning ONE Flyweight World Champion is Geje “Gravity” Eustaquio, 29, of the Philippines. The flyweight bout between Mite and Saw was the second bout of the evening with Kemp Cheng as the referee. Cheng put a stop to the contest at 2:48 of Round 1 when Mite knocked out Saw via technical knockout via strikes. While Mite now holds a professional MMA record of 1 win and 0 loss, Saw’s record downgraded to 1 win and 1 loss. The latter made his ONE Championship debut on November 3, 2017 at “ONE: Hero’s Dream,” which also took place at the Thuwunna Indoor Stadium. Saw submitted a fellow local athlete, Sit Mhan, via rear-naked choke at “ONE: Hero’s Dream.” In the main event of the same evening, Aung submitted Alain “The Panther” Ngalani of Cameroon and Hong Kong via rear-naked choke. 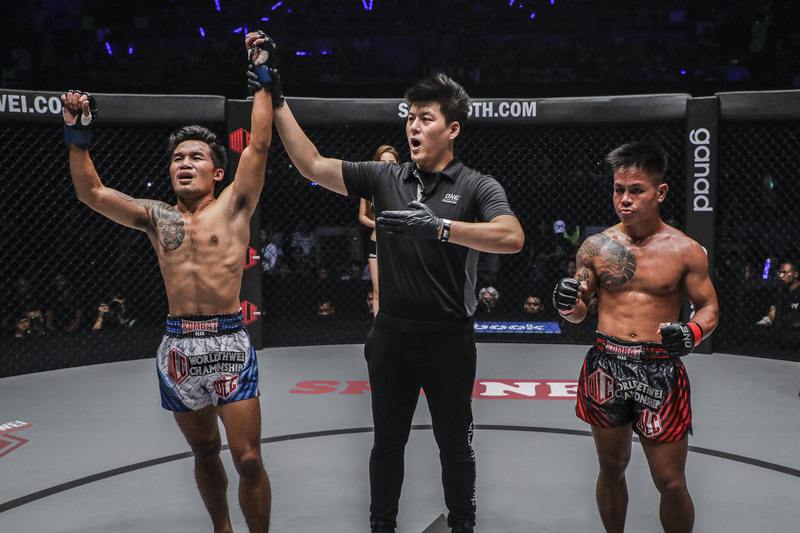 In the main event of “ONE: Spirit of a Warrior,” Aung successfully defended his ONE Middleweight World Champion title from Ken Hasegawa, 31, of Japan. The Burmese champion knocked out his Japanese challenger at 3:13 of Round 5.